With all the technology we have today you would think that doing certain tasks would be simpler and easier to accomplish. This is not always the case. 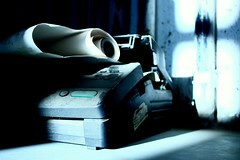 For example, many of us have the capabilities of faxing documents right from our own home. So, you send a fax, get the confirmation that the recipient has received it and you think to yourself that you have completed your task. NOT ALWAYS THE CASE! It was lucky that I decided to make a phone call regarding such a task that I thought was completed a week ago. What I found out during the telephone conversation was that they “claim” they never received the fax even though I checked the fax number and I had a print-out of my confirmation that the fax was sent. Thank goodness I made that call because as it stands now I have to wait an extra week to receive the documents that I had originally requested by fax. Another example, was when I called my cell phone provider to shut off my cell phone due to the poor service in the area I live. It was supposed to be shut off yesterday and when I called today to find out what amount I would owe on my last bill, the provider had not shut off my phone yet. So you see, although we have all these great ways of communicating nowadays, still the “old-fashioned” talk to an individual to confirm your communication is still very important. It’s a shame that we waste our time when it is unnecessary to make sure that what we have requested has been fulfilled.